The Skipper Blog: Are they ever going to get it right? Skip November 6, 2012 Blogs, Conservation, RECENT, Spot, The Skipper No Comments on The Skipper Blog: Are they ever going to get it right? Introduction by Skip Clement, previous and complete story on menhaden by Terry Gibson, current report by Atlantic States Marine Fisheries (Interstate Fisheries Management on menhaden) and voluntary polluting by consensus bureaucracies and “American Greed” in Florida via Lake O.
Menhaden fishing vessels deploy large seine nets off Virginia Beach. Imagine how many tons those holds can handle. 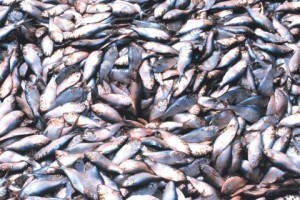 Talk about menhaden and mullet could put a classroom of grown up tree huggers to sleep in minutes. To us, sport fishermen from Maine to Texas, menhaden and mullet are as important as algae bloom fish kills, oil rig disasters and the ruination of fisheries by developers. Here in South Florida, there are unholy alliances between the Fanjuls and Big Sugar. Cattle, farming, South Florida Water Management District (SFWMD) and the Corps of Engineers (COE) whimsically discharge polluted water (or starve water from the Lake Okeechobee to the Caloosahatchee River and discharge enormous amounts of fertilizers and excrement polluted water into the St. Lucie) and send out a black wall of death, as they did this year, that has to date reached reefs 12 miles offshore, hindering the mullet run and damaging if not destroying the reefs. The Atlantic States Marine Fisheries Commission has scheduled public hearings on proposed measures to conserve and restore Atlantic menhaden to levels of abundance not seen in decades. Public comment on Draft Amendment 2 to the Interstate Menhaden Fishery Management Plan, a vital step in rebuilding the population of this critical forage fish, will be accepted through November 6, 2012. Fishermen and conservationists are being asked to weigh in on options of reducing current catch levels by 10, 20, 25 or 50 percent. A 2012 stock assessment update affirmed that overfishing is occurring and that the stock is likely overfished according to the new, more conservative reference points adopted by the commission last year to rebuild a population that is at an historic low. Over the past two months, recreational fishing organizations and conservation groups have engaged in an all-hands-on-deck effort to end chronic and accelerating rates of over-fishing on Atlantic menhaden. Thanks mostly to one company’s relentless netting with massive seines the Atlantic population of the species that scientists call “the most important fish in the ocean” has plummeted by an estimated 88 percent over the past 25 years—the lowest point in recorded history. 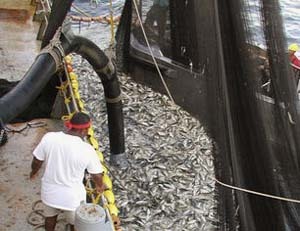 The call to action arose from an August decision made by the Atlantic States Fisheries Commission (ASFMC) to gather public comment on options to rebuild Atlantic menhaden. Options range from the status quo to reducing harvest by 45 percent. In short, Atlantic menhaden are nearing collapse, but no one is sure what, if anything the ASFMC will actually do about. Meanwhile, the symptoms of their previous inaction are evident. Studies prove that the proportion of menhaden in the diet of adult bluefish in the Chesapeake Bay have declined from 41 percent in 1991, to 11.6 percent in 2010. The virtual disappearance of weakfish along the Eastern Seaboard could be related to declining menhaden. Along the same timeline, the diet of adult weakfish in the Chesapeake consisted of 42 percent menhaden, but now they eat a scant 3.3 percent. 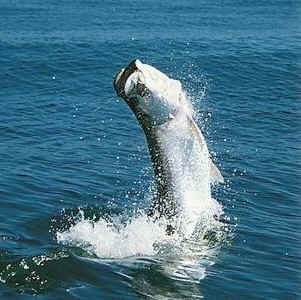 And striped bass once depended on menhaden for 70 percent of their diet. Stripers now derive as little as seven percent of their nutrition from the most nutritious forage fish in the Atlantic. Of course, this data begs the question “Why can’t fish and other wildlife just feed on something else?” That’s exactly what they are doing, but they can’t get the same nutritional bang for the buck from other forage sources. Menhaden provide a specific fatty acid, Omega 3, which offers many large predator fishes the energy to migrate, over-winter and reproduce. Menhaden aren’t the swiftest fish in the ocean either, and they gather in large schools, making easy targets of themselves for predators looking for maximum nutrition for minimal foraging effort. And when menhaden are lacking, stripers and bluefish cannibalize more of their own young and turn on the young of other gamefish, increasing natural mortality on top of fishing mortality. Malnutrition could also be playing a role alongside rising water temperatures and pollution in reducing natural immunities to diseases afflicting the majority of stripers in the Chesapeake Bay area. Sixty percent of striped bass in the Maryland portion of the Bay are infected with mycobacteriosis, a “wasting” disease that can be lethal. 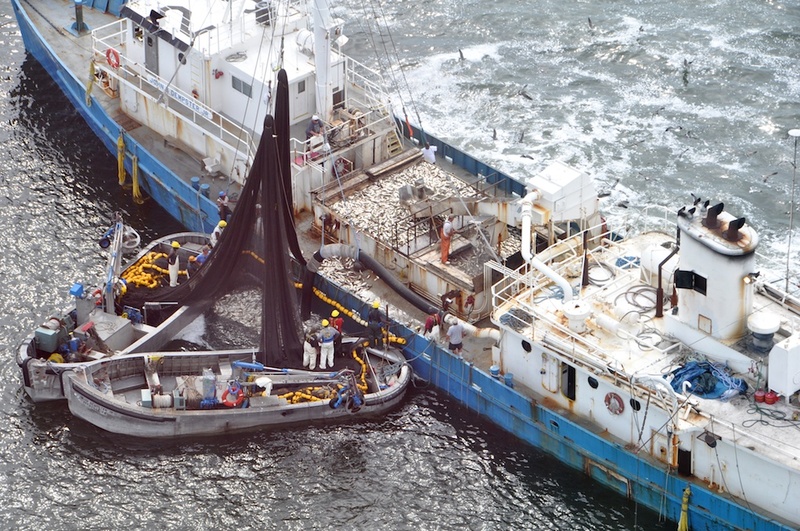 Vessels operated by Omega Protein kill about 80 percent of menhaden harvested annually. The company grinds up the fish and turns them into products such as fertilizer, dietary supplements and feed for animals including, increasingly, foreign fish-farming operations. They are starving wild fish, birds including ospreys and eagles, plus marine mammals including whales and dolphins to feed farm-raised fish. The Texas-based company maintains a fleet and processing plant in Reedville, Virginia, where it employs about 300 people. “Omega” posted a net income last year of $18.3 million, and wields considerable influence in Congress and over many of the ASFMC commissioners. Except that they are not allowed to fish in most states’ waters, and that there’s a cap set at about what they harvest anyway, Omega Protein is essentially the last, un-regulated industrial fishing industry in the United States. They have exceeded sustainable harvest levels every year but one since 1955. The point that is apparently lost on Omega, a vertically integrated company that must report quarterly earnings to shareholders, is that rebuilding Atlantic menhaden populations shouldn’t take that long. And, once rebuilt, all stakeholders, ranging from striped bass to Omega Protein, should be able to enjoy ample shares of the resource. Striped bass inspire more fishing trips and expenditures while supporting the most jobs of any other recreationally important species on the East Coast. The renowned economist, Dr. Rob Southwick found in 2006 that 3 million anglers spend roughly $6 billion annually targeting striped bass, a fishery that supports more than 60,000 jobs. Much of the outstanding advocacy underway on this issue has come from passionate striper anglers and groups such as Stripers Forever. But in the course of my own outreach I’ve found that angler in the South Atlantic aren’t as concerned. You should be. If you target cobia, tripletail, tarpon, red drum, spotted seatrout, most coastal pelagic tunas and mackerels—even billfish—you’ve got a lot riding on ending overfishing of menhaden.